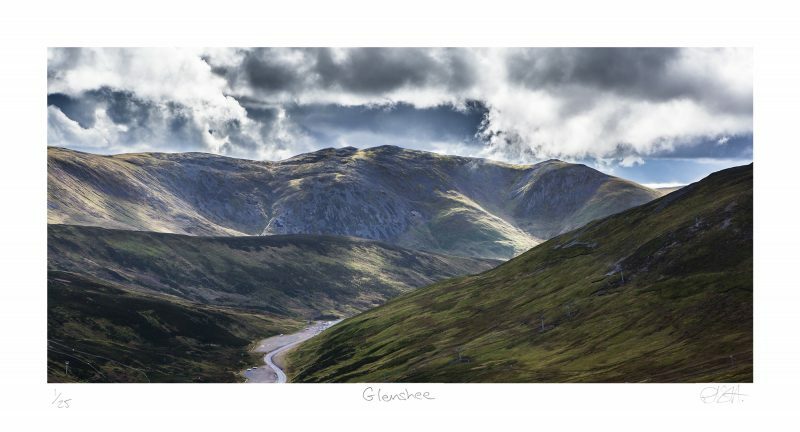 Looking south along the A39 from Glenshee. Scotland has to be one of the most incredible places to photograph on account of the ever changing weather. Clouds like this appear for a second and then disappear to form in to another incredible picture! The light in Scotland, especially in Spring or Autumn, makes it an incredible place to photograph. In the winter it is a great place to see ptarmigan and mountain hares. All my prints are available both as signed, fine art prints and unsigned photographic prints. Signed fine art prints are limited edition meaning that only a certain number will ever be printed, normally 25, though it varies. They are printed on fine art, Hahnemühle Photo Rag paper using Giclée printing, and each one is individually signed, numbered and checked by me. You know that only a certain number of these will ever be printed. You can see an example of how they look above. Unsigned photographic prints are processed directly by The Print Space using C-type photographic printing. They are printed with a white border around the edge containing my logo. An example can be seen on the right. Click on the image to see a larger example. Contact me for framed prices.